Eurocom Corporation (www.eurocom.com), a leading developer of High Performance Mobile Computing Platforms is now offering a complete range of modular VGA solutions based on MXM technology for embedded , industrial computing, Small Form Factor computer and CUDA developers. The solutions are aimed at embedded systems, SFF (Small Form Factor) PCs and CUDA developers that require higher performance GPU performance. 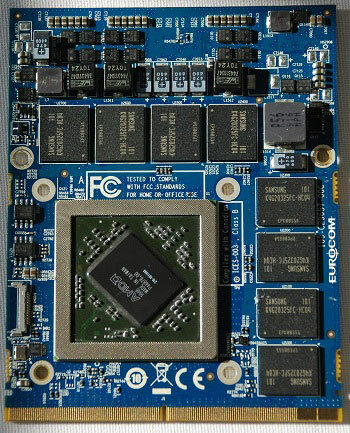 MXM, Mobile PCI-Express Module, is a connection standard for Graphics Processors in laptops, small form factor PC’s and embedded systems. The goal of developing MXM was to create a industry standard spec. The latest MXM standard, MXM 3.0 was released in 2009. Eurocom offers a line of MXM 3.0b video cards. MXM 3.0b supports cards with larger height, higher power requirements and 256bit memory bus, while also being fully compatible with lesser MXM 3.0a. The standard allows developers to upgrade the graphics processor in their systems without a complete graphics redesign, while also giving developers more graphics options for each system. MXM is more flexible and more customizable than other graphics options. MXM 3.0 standard for graphics systems calls for reduced power, improved cooling capability and a lower z-height, enabling designers to create smaller, more efficient embedded systems and speed time to market. Eurocom offers a complete range of VGA solutions with different TDP ranging from 45 W-100 W with various performance levels capable to meet most of the GPU requirements in such applications as CUDA Development, Signal Processing, Satellite imaging, Mapping, Surveillance, Image recognition, Robotics, Avionics, Digital signage, Medical imaging.